Is there any good news in the "Good News" for older adults? We're living longer. In fact, people 85 and older are the fastest-growing segment of the U.S. population. Life expectancy is increasing in all developed countries in the world. "I can't relate to Jesus' message any longer. The gospel calls for action. I can't do what Christ wants me to do, and I feel guilty." "The Old Testament comforts me more than the New Testament. These writings relate to my situation more since I'm old, flat on my back, and utterly dependent on others." "The church has no place for old people." "I feel that I have outgrown Jesus —he's for beginners in the spiritual life." Out of Thibault's reflection on the relevance of the gospel to later life comes hope. "While secular society offers long-term care insurance, Jesus offers the promise of abundant life in the here and now as well in heaven," Thibault says. 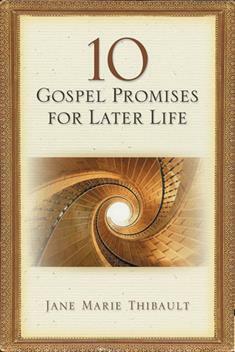 Each chapter of 10 Gospel Promises for Later Life addresses a fear about aging and faith and gives an example of its negative effect on a person's daily life. Next you'll find a response, the promise of the gospel, the assurance of God's constant love that offers hope in all circumstances. Identify your own fears (or the fears of a loved one) about aging, and learn from Thibault's sensitive study how to make the most of God's gift of longer life. Questions for personal reflection or group discussion are included at the end of each chapter, making it an ideal book for individuals or classes.